John Neville (2 may 1925 - 19 november 2011) was a British actor who played Sherlock Holmes in 1965 in A Study in Terror with Donald Houston as Dr. Watson. In 1970, he played the Duke of Wellington in The Adventures of Gerard adapted from several Arthur Conan Doyle's stories from the Brigadier Gerard saga. 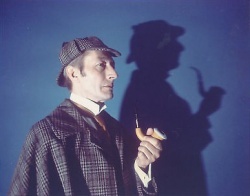 In 1971, he was Dr. Thorndyke in episode A Message from the Deep Sea of the TV series The Rivals of Sherlock Holmes. 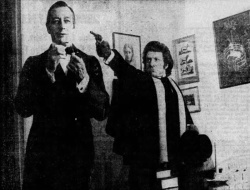 In 1975, John Neville played again Sherlock Holmes in the play Sherlock Holmes by William Gillette at Broadhurst Theatre on Broadway (New York) with Dennis Cooney as Dr. Watson. He also played Dr. O. Henry in 1998 in episode The Case of the Celestial signal of the TV series The Adventures of Shirley Holmes, Detective with Meredith Henderson as Shirley Holmes (the great grand niece of Sherlock Holmes).